This book is a comprehensive account of five extended modules covering the key branches of twentieth-century theoretical physics, taught by the author over a period of three decades to students on bachelor and master university degree courses in both physics and theoretical physics. 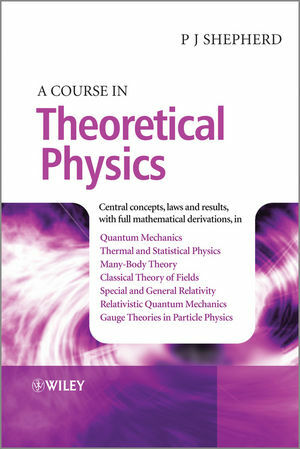 The modules cover nonrelativistic quantum mechanics, thermal and statistical physics, many-body theory, classical field theory (including special relativity and electromagnetism), and, finally, relativistic quantum mechanics and gauge theories of quark and lepton interactions, all presented in a single, self-contained volume. In a number of universities, much of the material covered (for example, on Einstein’s general theory of relativity, on the BCS theory of superconductivity, and on the Standard Model, including the theory underlying the prediction of the Higgs boson) is taught in postgraduate courses to beginning PhD students. A distinctive feature of the book is that full, step-by-step mathematical proofs of all essential results are given, enabling a student who has completed a high-school mathematics course and the first year of a university physics degree course to understand and appreciate the derivations of very many of the most important results of twentieth-century theoretical physics.